So much for the “high” life? «Inventio! Inventio! I have to credit my niece for this photo, which I borrowed from her Louisinaview blog. What an astonishing picture! What can we say of this poor Louisiana possum? But alas, his fate is perhaps merrier than those of his lot who meet more violent ends as roadkill. 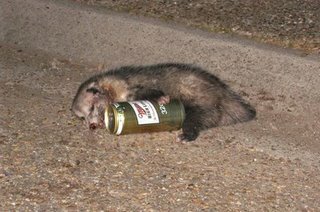 Best possibility of all is that he is just “playing possum” and after the cameraman disappears, he bounces to his feet and wobbles off into the woods, a little hung over and hopefully wiser for the next evening’s scavenging raid.